Las Vegas Premium Outlets are two very popular destinations for locals and tourists looking for cheap bargains on designer clothes, shoes leather and accessories. There are two locations of the outlets - North And South. 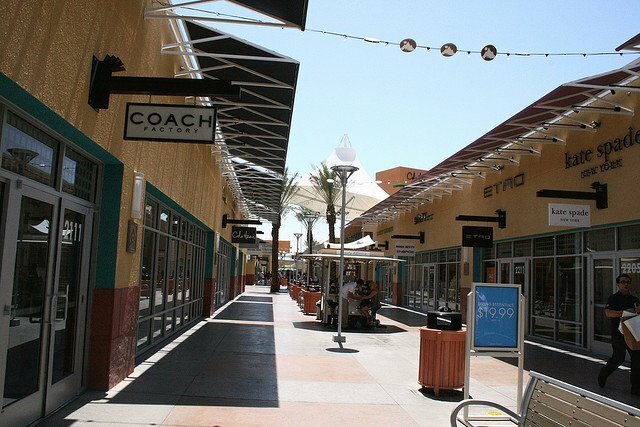 For many tourists, Coach Outlet Las Vegas is the main reason to visit Premium Outlets. You can find excellent Coach leather bags, accessories, wallets for both men and women at both locations with savings up to 50%. Both North and South locations of Vegas Premium outlets have Coach stores. According to some shoppers, there is no much difference between the Las Vegas Premium Outlets North and South. However, these two locations differ in at least two main aspects. North location is more upscale, has 150 stores and is an outdoor mall. South location has 140 more affordable stores, and is an indoor mall. 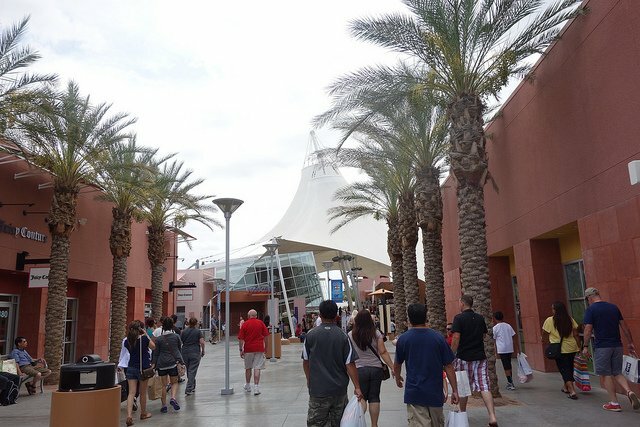 Las Vegas Premium Outlets North are more popular both among the locals and tourists. You can find virtually anything in this part of the Premium Outlets as it is home to almost all the famous and expensive brands of the world ranging from Kelvin Klein to Giorgio Armani. If you are in Las Vegas and want to shop at some really fabulous designers stores at discounted rates, the North location is the place for you. Las Vegas Premium Outlets North with more than 150 stores offering discounts and bargains on name brand merchandise is a paradise for shopping lovers, especially women! Some important stores found here include Ann Taylor, Adidas, Brooks Brother, Banana Republic, DKNY, Diesel and Hugo Boss. The North outlets are considered by many as the higher end compared to the South location. Although the prices are higher, you will end paying less here than at regular stores. People are especially raving about their Kelvin Klein and True Religion Jeans outlets. The North location of the Premium Outlets is a perfect spot to go on a spending spree - the discounted offers help you to spend less. The best way to get most of these offers is to join the VIP lounge that offers coupons for both Las Vegas Premium Outlets North and South. Keep in mind that the North location is an outdoor shopping mall. There are no congested and closed stores and you shop in an open air environment, Just ensure that you are properly dressed for a rainy day and you will have a lot of fun shopping! It's easier to get to the Las Vegas Premium Outlets North by bus (SDX from The Strip) than to drive there. Thanks to its popularity the mall definitely has problems with parking space despite the major expansion in 2008. However, this is the problem that most of popular outlet malls have these days. Las Vegas Premium Outlets South offers discounts on irregular, out of season or overstock merchandise. Located a couple of miles south of Mandalay Bay, this is a shopping mall for average shoppers, compared to its sister property North that is occupied by high-end factory stores. The South location of the mall is comparatively cheaper than its North counterpart and offers more affordable and less high end brands. Las Vegas Premium Outlets South is a good place to shop in Las Vegas if you are on a budget, as other malls on the Strip are quite expensive. In fact, some people prefer South rather than North Premium Outlets as it is a better representative of the malls they will find in their own cities. Even the famous brands such as Kelvin Klein sell discounted merchandises here, making it perfect for average shoppers with low budget. Basically, you buy cheap things that are out of season or out of fashion but you can definitely wear them during the next season. The South location has more than 140 stores offering great discounts on all the items they sell. These are good bargain stores, but you obviously cannot expect the latest fashion trends here. Las Vegas Premium Outlets South is an enormous mall with tons of shopping options to choose from according to your taste and budget. It offers you an opportunity to shop without breaking your wallet. It is the best place to wander and shop for top designer brands and still have enough money to enjoy for the rest of your trip. You can easily find here dresses, shoes, beauty accessories or other things from famous brands such as Ralph Lauren, Kelvin Klein, Tommy Hilfiger, Brooks Brother etc. Las Vegas Premium Outlets South has something for everyone whether you are looking for gifts for children or a perfect yet cheap dress to wear for your friend's wedding. Remember to join their online VIP Lounge to get free coupons and you will pay much less for similar things you find in other stores.